For a decently priced one-pin option, this one comes with a wide range of adjustments, which makes it a must-have in many people’s books. You can pick from .019-inch and .010-inch pin sizes, which offers extra versatility for a product that is already well rounded. The sight tape placement provides additional convenience, and it is one of those features that recommend it among many other similar single-pin configurations available. Be aware of the fact that this bow sight is quite noisy; that means that you should not use it when you know you are within close range of animals you intend to hunt; depending on the prey you are after, this could be a make or break issue. – Most probably the selling point of this well-equipped bow sight is the price tag. You might not expect a model that basically comes loaded with features to cost under the 100-dollar mark, but this one does. If you happen to grab it at a discount, you will get an even better deal. It is also versatile since it allows you to swap different size pins with great ease. You most probably won’t get a better deal for this price, which is why it is among our choices for single-pin configurations. – The amount of adjustments on this model is another great plus that we feel obligated to talk about. For starters, you can work on the windage and elevation, and the micro-click adjustments you can make qualify this model for 3D shooting, and not only for hunting, in case that is something you want to do. The incremental adjustment option is often found on models with multiple pins, but we want to cover all the bases, which is why we recommend this particular option that brings together what’s best of both worlds. 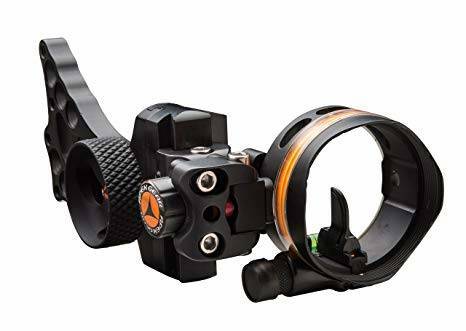 Also, you might be surprised to learn that this model works with dual and third axis adjustments, which means that you will be able to spot and take your aim at targets that are located at awkward angles or at far distances from you. 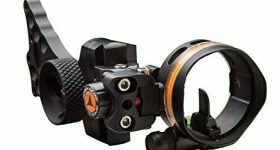 – Speaking of far distances, if you have been looking for the right equipment to include the yardage on your shots, you cannot ignore this bow sight. With the possibility to ensure that you can shoot at distances of up to 100 yards, the APEX GEAR Covert comes with plenty of yardage tapes to ensure that you get to shoot with the precision you need to hone your skill as a bowhunter. – You will not have to worry about visibility in low-light conditions. The pins are decently bright, although some people might not be that pleased with them. In case you may discover that you are one of these people, just take advantage of the included light that will make it easy for you to find your target and aim at it, even when you don’t face perfect environmental conditions. As you can see, the APEX GEAR Covert offers what you can usually discover on more expensive models, so it is pretty neat that you can take advantage of this top-of-the-line feature, while spending considerably less. The fact that it is decently priced works in the advantage of this bow sight, but it does not match the quality and number of the extras that are delivered with this single-pin configuration. One excellent thing about it is that it can be used in a broad range of applications. Whether you want to go bowhunting, or you want to use the sight for 3D shooting competitions, you will notice that it does a great job in all conditions. A broad range of adjustments makes this particular bow sight such a good option for anyone looking to pay little for decent performance. However, that may, at the same time, work against it since some people say that working out all the adjustments needed might take a bit more tinkering than what they would like to do. Nonetheless, if you are the tinkering type, you might discover that this particular bow sight is right up your alley.